► See also: Is Periodontal Disease Caused by Poor Dental Hygiene, Calculus or Food Stuff ? 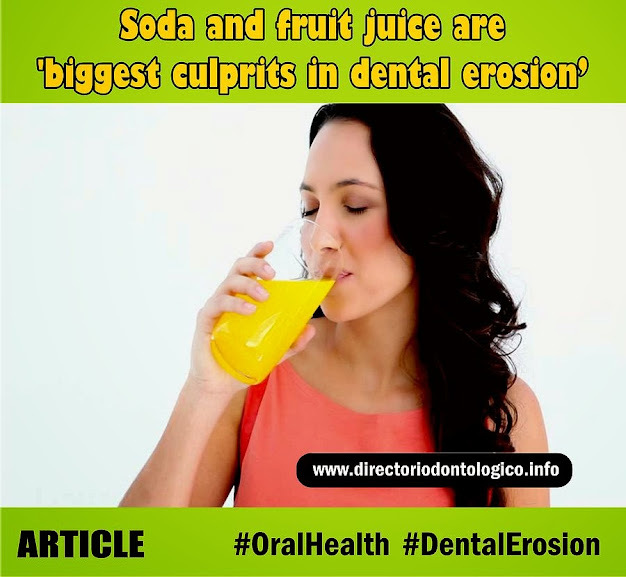 The study finds that a substantial proportion of adults show some evidence of dental erosion, with the most severe cases being among people who drink sugary soft drinks and fruit juices. Examining 3,773 participants, the researchers found 79% had evidence of dental erosion, 64% had mild tooth wear, 10% had moderate tooth wear and 5% displayed signs of severe tooth wear. The participants in the study with moderate and severe tooth wear consumed more soft drinks and fruit juices each day than the other groups. Among participants with lower levels of tooth wear, the researchers found that milk was a more popular drink than soda or fruit juice. Men were also found to be at twice the risk for dental erosion as women, and tooth wear became more severe with age among the participants. Commenting on the study, Dr. Nigel Carter OBE, chief executive of the British Dental Health Foundation, says that while fruit juice may be a nutritious drink, the high concentrations of sugar and acid can lead to severe dental damage if these drinks are consumed often each day.